When we talk about the origin of jamón, we refer to the place where it is made. Salamanca jamón, typical of this province and also known as Guijuelo jamón, is one of the most widely consumed hams in and outside our country and has a flavour and texture that distinguishes it remarkably from other origins. Choose one of the products we offer at Enrique Tomás and see for yourself! The Jamón de Salamanca is better known under the name of "Denominación de Origen de Guijuelo" (Denomination of Origin of Guijuelo), a town with just over five thousand inhabitants where hams are produced at an altitude of more than one thousand metres with cold and constant winds. The dryers or special places (where the hams are stored for dry curing) play a fundamental role in the taste of these refined products and, since they are exposed longer than hams or ham shoulders of other origins, you get a meat with less salt and a sweeter, smoother taste on the palate. As far as breeding is concerned, it should be stressed that the pigs were not born and raised in Salamanca, but rather in the different meadows that the producers have in the various regions of Castilla y León and Castilla-La Mancha, Extremadura or Andalusia and those that are chosen to make La Montanera, i. e., live in freedom and feed on acorn and other natural products. Which products from the Jamón de Salamanca make up our catalogue? At Enrique Tomás we distinguish the Jamón de Salamanca with the yellow label and we have hams or ham shoulders both sliced or in whole piece. The Jamón de Guijuelo that we offer can be of "cebo" or Bellota (acorn) and the same occurs with the ham shoulder. In addition, it is worth mentioning that we also have 100% Jamón Iberico Salamanca, that is, the authentic Pata Negra of the region. These whole pieces share the lead role with our "Travel packs” sliced packs of ham or ham shoulders and the sliced packages of 80 grams cut with a knife. 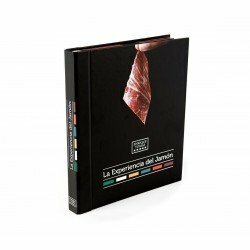 Finally, it is worth mentioning the "Libro de la Experiencia del Jamón" (book of the Ham Experience), where you can taste this ham and other hams from other origins, as well as the 100% Bellota Flavours of Salamanca, where, in addition to enjoying the ham, you can taste the chorizo, salchichón and lomo of this region. As you can see, we have everything! Take the product of your choice and enjoy a delicious and sweet taste! You'll simply love it!